Fresh frozen plasma and cryoprecipitate are stored frozen at -20 0 C to -24 0 C for up to 3 months, -250 C to -29 0 C for up to 6 months, -30 0 C to -39 0 C for 12 months; -40 0 C to -64 0 C for 24 months and -65 0 C and below for 7 years or longer. First successful human blood transfusion was done in 1818 by Dr. James Blundell to treat postpartum haemorrhage, later in 1900 Karl Landsteiner discovered the ABO blood group system. Approximately A total of 36 human blood group systems exists with 346 antigens which are now recognized by the International Society of Blood Transfusion. The two most important blood group systems are ABO and the Rhesus (Rh) blood group systems which are used to determine someone’s blood group which may be A, B, AB and O, with +, − . Rhesus positive individuals i.e. A+ ,B+, AB+ and O+ poses Rh antigen on the surface of their cells while Rhesus negative individuals i.e. A-, B-, AB- and O- do not pose Rh antigen on the surface of their cells. The presence or absence of rhesus antigen does not mean presence or absence of a disease pathogen or infection. For safety in blood transfusion, patients receiving blood must have their blood groups matched with compatible blood group from blood donors as illustrated in the table below. Approximately A total of 36 human blood group systems exist with 346 antigens which are now recognized by the International Society of Blood Transfusion. The two most important blood group systems are ABO and the Rhesus (Rh) blood group systems which are used to determine someone’s blood group which may be A, B, AB and O, with +, − . Rhesus positive individuals i.e. A+ ,B+, AB+ and O+ poses Rh antigen on the surface of their cells while Rhesus negative individuals i.e. A-, B-, AB- and O- do not pose Rh antigen on the surface of their cells. The presence or absence of rhesus antigen does not mean presence or absence of a disease pathogen or infection. Blood and blood products have different uses depending on the patient’s/recipient’s ailment. KNBTS issues blood as Red Packed Blood Cells, Fresh Frozen Plasma, Platelets, Cryoprecipitate and Whole Blood. Red blood cell transfusions are used to treat haemorrhage and to improve oxygen delivery to tissues. Transfusion of red blood cells should be based on the patient’s clinical condition. Indications for transfusion include symptomatic anaemia (causing shortness of breath, dizziness, congestive heart failure, and decreased exercise tolerance), acute sickle cell crisis, and acute blood loss of more than 30 percent of blood volume. Plasma products available include fresh frozen plasma is recommended in patients with active bleeding. 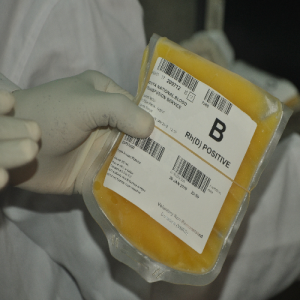 Fresh frozen plasma is indicated for correction of coagulation abnormalities. Platelet transfusion may be indicated to prevent haemorrhage in patients with thrombocytopenia or platelet function defects. Cryoprecipitate is prepared by thawing fresh frozen plasma and collecting the precipitate.